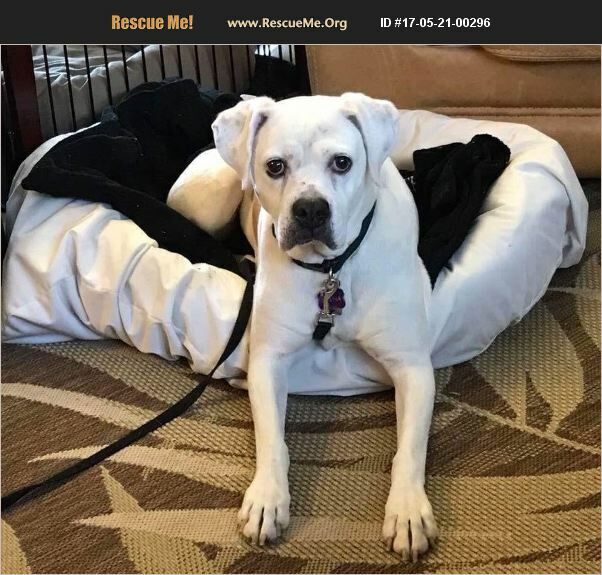 [Read About Natural Incontinence Care] Serena White, splashes of fawn on her back and tail nub 8.5 Years Old Pocket Boxer 52 lbs �'ۢ	Incontinent: requiring 2x daily medication and occasional diapering �'ۢ	Medical History: mammary & skin tumors removed 1/5/18, and some arthritis in left rear knee �'ۢ	We don't know what physical trauma may have caused her crooked lil' jaw and small dent in her brow; but we suspect it occurred in her youth �'ۢ	Very well crate trained: expects a treat to enter �'ۢ	Does great with dogs after slow and proper intro �'ۢ	Great uncrated too (she is scavenger so make sure things are put away) �'ۢ	Basic obedience (does pull on the lead) with great recall, she also shakes & gives high fives �'ۢ	Cat untested �'ۢ	Loves car rides �'ۢ	Great with teens (younger children untested beyond short visits) �'ۢ	House trained and uses a dog door (can create a challenge when diapered) Fostered in Spokane, WA Serena's foster mom here, Serena is the most endearing lil' Boxer I have ever encountered. We first fostered her six months ago and fell in love, so when she needed to come back into rescue, we were glad to welcome her back and within two hours she just slipped back into our household routine. If she could make it happen, she would subsist on belly rubs alone. She welcomes your touch and gladly snuggles in for a cuddle whenever you are ready. She'll shake your hand or give you a high five and when you've forgotten to give her a belly rub she'll gently tap your arm as a reminder. She greets you with wiggles and smiles and lights up each and every time you use her name or speak to her. Shockingly, this pint-sized girl fits in with all three Boxers in our pack and they are all huge and ill mannered in comparison. She has had a calming effect on each of them. Why was such an ideal pup returned to the rescue you ask. Her incontinence is not easily managed with meds and she requires diapers, which she rocks BTW, and this has earned her the nick name Ms Piddle Pants. She does not soak her diaper. On the contrary, if you are using a liner in the diaper, she'll leave a few little spots from time-to-time. As long as you've been diligent in keeping her medication schedule, her leakage is minimal. As a dog owner for over 40 yrs, I cannot image a quality home she would not fit within. She is wonderfully behaved (leaps and bounds above our dogs). She does as you ask (come, go, sit, shake, high-five, crate). She is very food motivatedshe loves to eat, so if you want her to do something she doesn't know just offer her a treat. Complete you application right away- bit.ly/WHBRadopt.